New York Times columnist David Brooks used to be a Republican — a somewhat heretical Republican on occasion, but a GOPer nonetheless — back in the days when his perch was the Weekly Standard. Upon ascending to the Times in 2003, he began his career as a professional centrist, albeit one who more often than not descended from lofty disdain for the ignorant armies of left and right to a landing point that happened to coincide with GOP positions. Now I realize that Whigs are the most important political force in America today. It’s just that the people who are Whigs don’t call themselves Whigs and they are all on the local level. It seems that entrepreneurial innovation, civic activism, and a can-do spirit are (to Brooks anyway) Whiggish traits. Local improvement can go only so far when national politics is a meat grinder. The good news is the solutions to our civic problems already exist; it’s just that, as the Fallowses write, these stories are lonely and disconnected. We just need to take these civic programs and this governing philosophy and nationalize them. We need to transform these local stories into a coherent national story and a bottom-up coalition, which will look a lot like a 21st-century descendant of the 19th-century Whigs. It is characteristic of Brooks (and other professional centrists) that he has given up on making either of the two major political parties an instrument for what he wants and is fantasizing about a new/old party breakthrough that there is no reason to believe will ever happen (he links to the website of an extremely obscure organization called the Modern Whig Party, and suggests without any evidence an organic connection to the developments in the Fallowses’ book). The choice of this particular historical model is revealing as well. 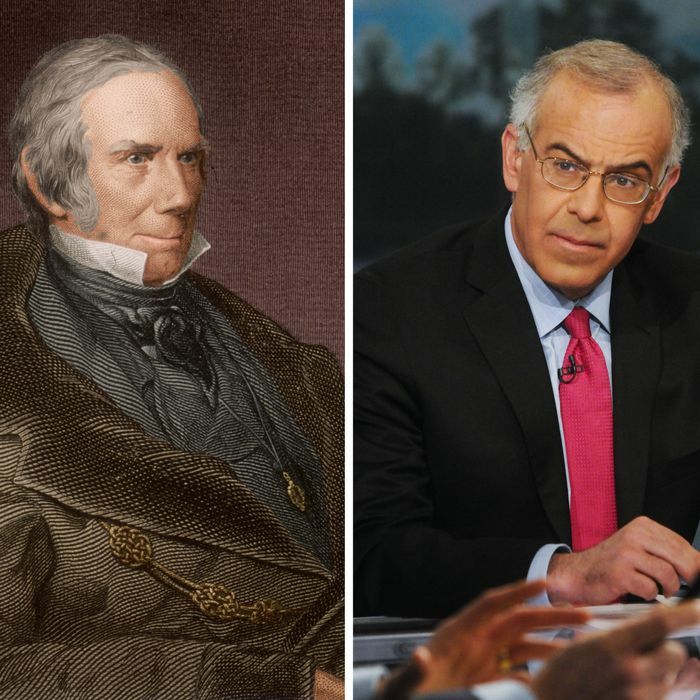 Yes, during their relatively brief run in the early 19th century the Whigs associated themselves with many of the values Brooks has seemed to cherish since his Republican phase in which he promoted “national greatness conservatism” — along with some he probably doesn’t, like very high tariffs and an association with Protestantism. But as a model for overcoming divisions over big national issues and getting things done — the itch David Brooks really wants to scratch — the Whigs are a really bad choice. The Whigs expired, after all, because they could no longer thrive as a national party that existed very specifically to avoid the big sectional issue of their day, slavery. Southern Whigs largely joined their Democratic colleagues in demands that the federal government become a partner in the project of expanding slavery, while Northern Whigs (the ones that didn’t get sidetracked into the nativist blind alley of the Know-Nothings, another Whiggish legacy Brooks should think about), joined Free Soil Democrats in contesting those demands until they were finally thwarted. Sometimes the desire for national unity and “getting things done” isn’t so morally superior after all. The Whigs were a big part of the problem that led the country to Civil War in the 19th century. It’s hard to imagine their example serving as the big solution for the country right now.